Texas early voting has started. 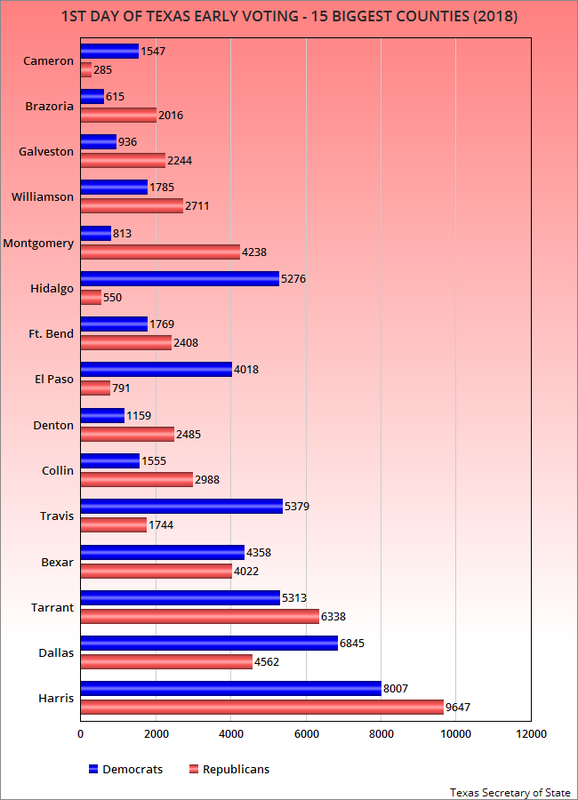 The charts I show here use information from the office of the Texas Secretary of State. 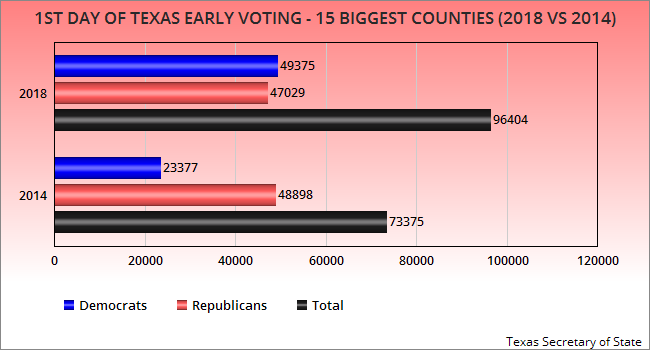 It shows the early voting totals for the 15 largest counties in the state. Those counties have about 66% of the state's registered voters. And the results for the first day of early voting should encourage Democrats. Note (in the chart above) that the first day total of early voters is up from the last off-year election of 2014. In 2014, 73,375 people cast their vote. This year, 96,404 people cast a ballot on the first day. The increase is due to an increase in the number of Democrats casting an early vote. The number of Republicans remained fairly constant (48,898 in 2014 and 47,029 in 2018). But the number of Democrats more than doubled on first day voting (from 23,377 in 2014 to 49,375 in 2018). This does not necessarily mean the Democrats are going to outvote Republicans statewide, and it doesn't assure a Democratic victory in November. But it does show that Democratics are fired up and enthusiastic about voting this year -- and that's a good thing. The chart below shows the number of voters for each party on the first day in each of the 15 largest counties.